← BEACON Researchers at Work: What do evolution, cancer, and optical character recognition have in common? This week’s BEACON Researchers at Work blog post is by MSU graduate student Jessica Caton. Birds are everywhere! With 10,000 species living on every continent, you are bound to have come across a bird in your lifetime with possibly a unique story to go along with this sighting. From children’s games to TV shows and commercials, birds have become social icons: Aflac, Big Bird, Donald Duck… to name a few! I have always wanted to work with animals, but only started to become interested in birds in my undergraduate degree. I became fascinated with the complexities of animal behavior, especially when learning about bird behavior. I was fortunate enough to gain work experience with bird species in zoo, laboratory, rehabilitation, and field settings. Two past experiences focused my future interests on working with waterbirds. In my senior year, I completed a study abroad through MSU to travel to Antarctica. 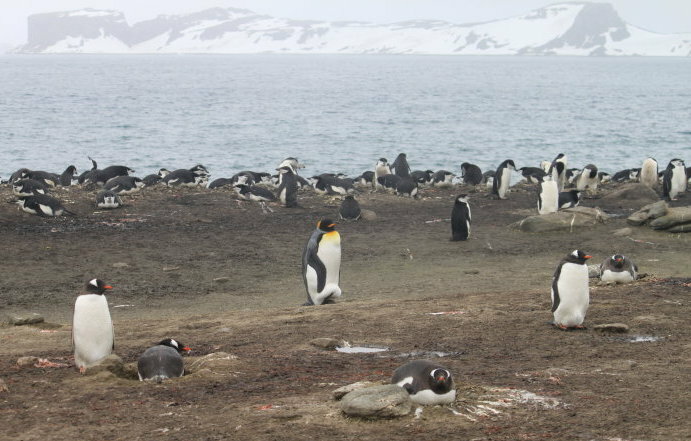 The trip to Antarctica offered me the chance to be able to see and observe pelagic seabirds like albatross, petrels, and penguin species; it was amazing to see penguins that spend most of their life at sea, now nesting in a colony with a population larger than some U.S. cities! It was a truly life-changing trip that made me interested in studying marine birds. 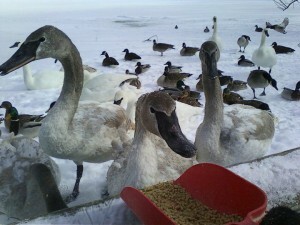 After graduation, I completed an internship at the Kellogg Bird Sanctuary in Augusta, MI. I was in charge of caring for captive waterfowl, game birds, and raptors along with educating visitors about the birds. 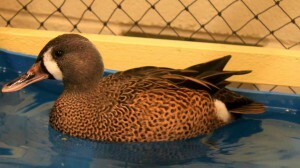 Through my short time there, I gained a fond interest in wild and captive waterfowl. I became interested in migration after observing waterfowl (e.g. Mallard Ducks and Canada Geese) that never seemed to migrate versus the migratory waterfowl at the edge of the lake that would only stopover for a short time. Birds are remarkable in many ways; one is their ability to migrate long distances. An extreme example is the Arctic Tern; only weighing half a pound, this bird migrates from the Arctic to the Antarctic (~22,000 miles roundtrip)! Bird migration studies date back to Aristotle, 3000 years ago. The first ornithologist known to describe bird migration was Holy Roman Emperor Frederick II in 1240 who made the connection between the movement of birds with lack of food and cold temperatures. Since then, our understanding of migratory behavior of birds has been furthered by numerous experiments. It is now known that birds increase food intake to gain weight to prepare for the energetic demands of migration. Birds also become restless nearing the time to migrate. One way to study migratory behavior is by housing birds in captivity. In the late 18th century, Johann Andreas Naumann was the first to document migratory restlessness (called Zugunruhe) in captive birds. He observed birds perch hopping, wing flapping, foraging, and flying. By manipulating photoperiod (daylength), scientists are able to artificially initiate migration and observe if the bird housed in captivity becomes restless or increases activity as if they were actually migrating. There are many techniques to study captive bird migration; infrared video is the most recent technique to study nocturnal activity in birds. 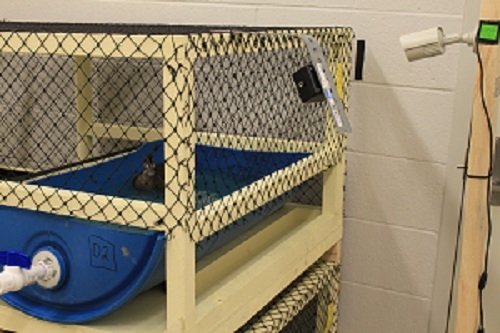 There is an abundance of literature and studies on migratory restlessness and behavior in captive landbirds; however, there are relatively few studies on marine and aquatic birds. 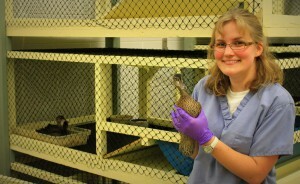 I am a Master’s student in the Avian Health and Disease Ecology Lab at MSU, led by Dr. Jen Owen. 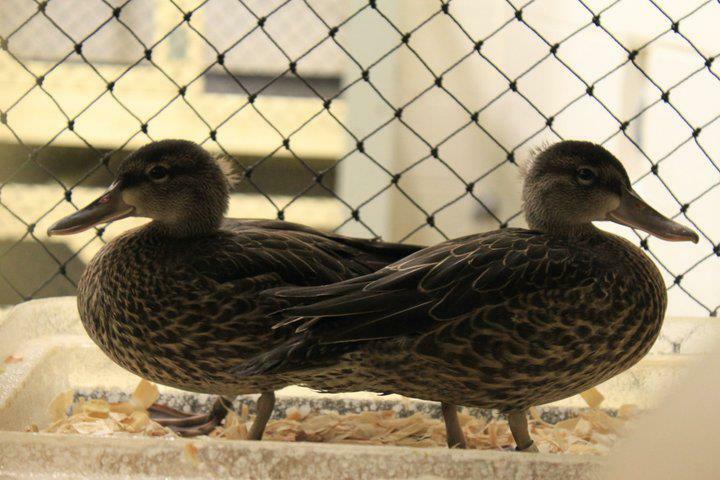 My Master’s research is studying the migratory behavior of captive Blue-winged Teals in both fall and spring migratory periods. 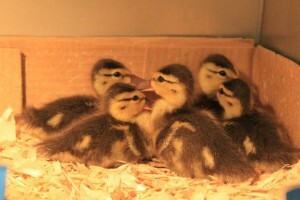 According to Birds of North America (2012), they are considered the second most abundant duck in North America. Blue-winged Teals are dabbler ducks that breed in Canada and northern US and are found around marshy ponds and mudflats. 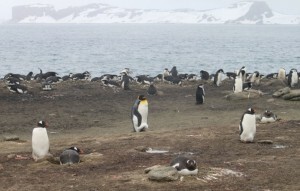 They are considered trans-continental migrants as their wintering grounds range from the southern U.S. to South America. They are the first to migrate south for the fall and the last to migrate north for spring. Unlike many waterfowl species, Blue-winged Teals are obligate migrants, which means the urge to migrate is innate; because of this, they make for a fitting focal species to study migratory behavior in captivity. 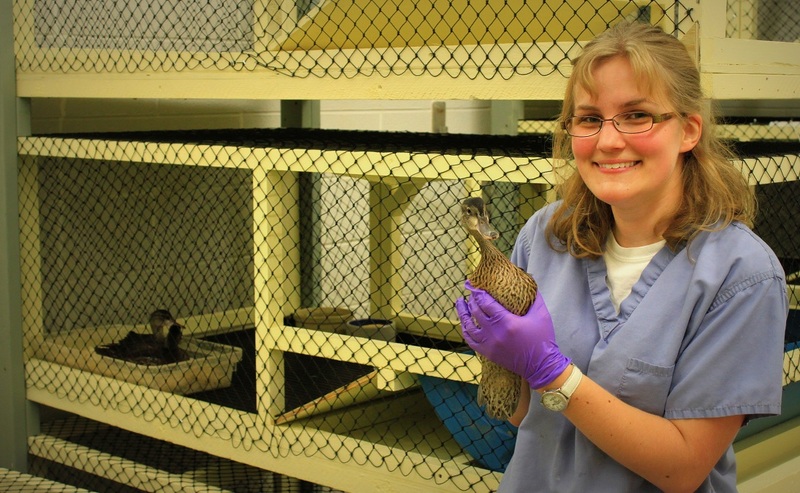 My research began with Blue-winged Teal eggs that were collected from nests in North Dakota wetlands and hatched in an incubator in Michigan. 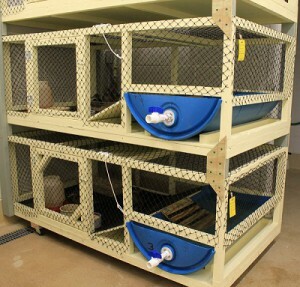 At one month of age, they were individually housed in custom built cages (6’L x 3’W x 2H’) that were equipped with an infrared motion sensor and an infrared video surveillance camera that recorded all nocturnal activity. Vocalizations were captured by audio recorders placed in each room. If we keep teals on a natural photoperiod during fall migration, will the birds exhibit migratory behaviors? If we increase daylength during in spring, will the birds gain weight and become more active in preparation for spring migration? Do these forms of data collection capture migratory restlessness in captivity specific to Blue-winged Teals? I am currently coding the videos to assign position (sitting, flying, swimming, etc), behavior (foraging, preening, resting, wing activity), and resource (location of duck in cage). This coding will be analyzed in conjunction with the motion sensors to see if migratory restlessness or active heightened behavior was observed at night. In addition, audio recordings will be used to see if there is a correlation between this heightened activity and an increase in vocalizations. behaviors of captive waterfowl in a way that has never been done before! Not only does this research embrace a novel form of technology, it helps to create detailed data for researchers to witness behaviors hard to capture in the field. This foundational research is considered a baseline study, which can possibly be used for future studies addressing the impact of zoonotic diseases, rehabilitation/reintroduction programs, and further understanding specific behaviors. And this, my friends, is my Tiny Teal Tale! For more information about Jessica’s work, you can contact her at catonjes at msu dot edu.